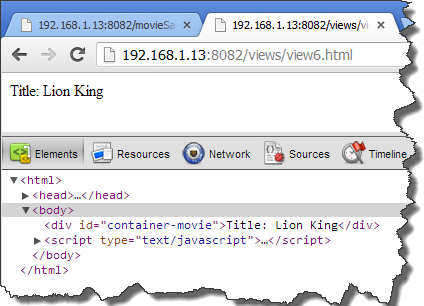 In this example we created added a “div” with the id “container-movie”. We will add text to this DOM element. In the previous post we logged everything to the browser console. Now we are ready to render content in the DOM. The purpose of this simple render function in Backbone is to provide standardization. So we will override the Backbone view Render function. In our render function we append the string “Title:” and the value in the model to the “el” property of the view. 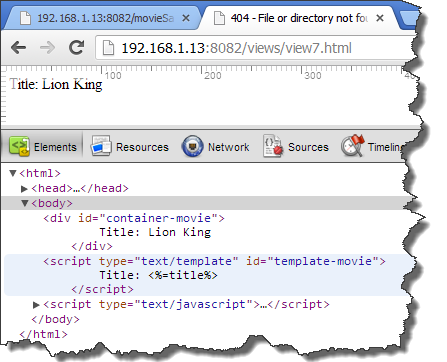 We then use jQuery to find the element in the DOM with the id of “container-movie” and assign the html of “el” to the element. 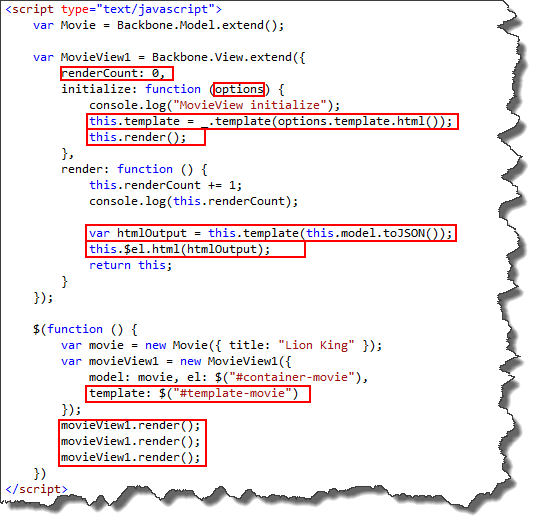 When we created the movieView1 object we passed in the model, which was assigned to the view model’s property. When we call render function, the render function is executed. Take notice that when we instantiate the movieView1 we are passing in the “el”. The “el” is set to the container that we want to update. 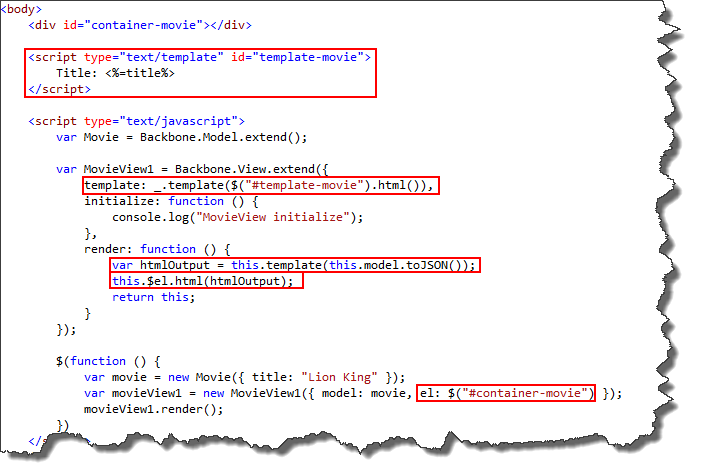 In the view we automatically create a template property that creates a compile version of the template. 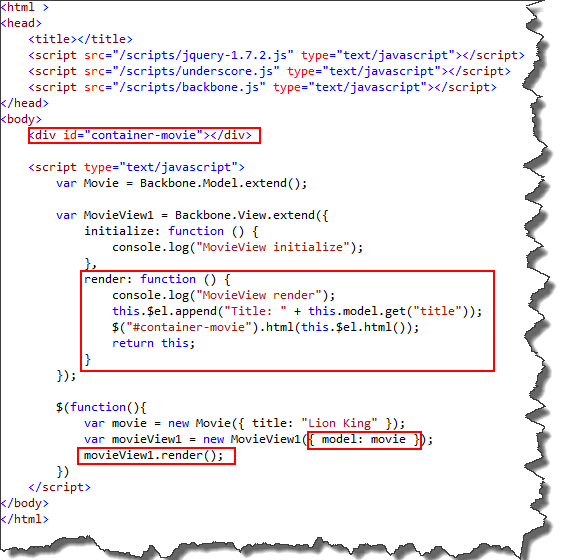 In the render function, we are passing the model data to the template function and return the html result. 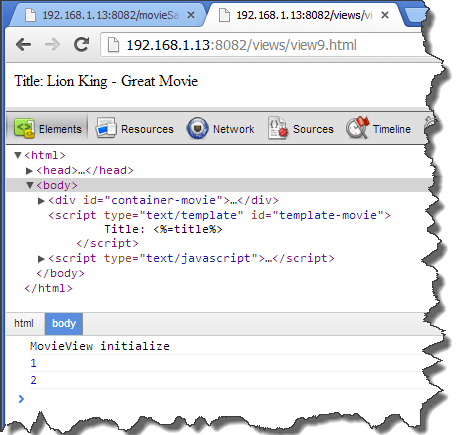 We then assign the htmlOutput to the view’s “$el” property, which is pointed to the container that we want to update. Since we are going to call render multiple times we will use renderCount property to track the number of time we call render. When we create an object based on the view, we will pass in the template. Since “template” is not a property that Backbone merges automaticly, we need to use “options” in the initializer. In the initializer we compile the template and assign it to template. 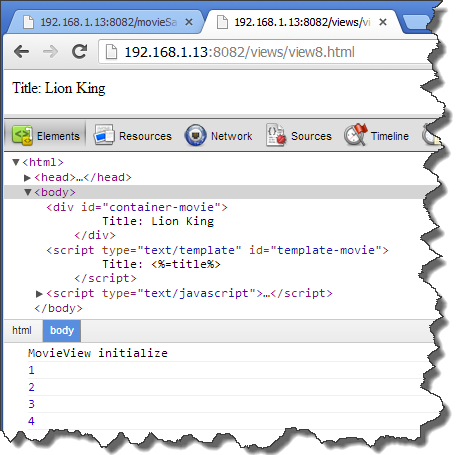 Now the template property of the view is a function that we can call. Also in the view we are calling render. This is common in many examples I have seen. In the render function, the template is called and passed the model data. The results of the model data is applied to the template that was passed in through the initializer. Since “el” was assigned to the container, the results are automatically applied to the DOM. In the previous examples we returned “this” from the render function. By returning this, we are able to chain the results of render. Thanks for taking the time to make these backbone.js walkthroughs.